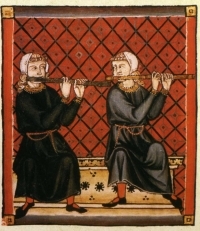 Cantigas de Santa Maria manuscript illustration. In my previous role as a supervisor and training director, I often found my students repeating back to me the phrase that James Bugental taught about “listening to the music rather than the lyrics” when conducting therapy. Bugental had a nice way of putting it by teaching us to facilitate the clients “talking out of themselves rather than about themselves.” This meant that often in therapy, what mattered most was not what was said but how it was said. Eugene Gendlin, who taught us about focusing, said the same thing. Gendlin presented research that found even undergraduate students with little to no training can recognize effective as opposed to non-effective sessions based upon listening to how clients expressed themselves. This is easy to recognize but difficult to facilitate. A beautiful piece of art that helps me to illustrate this principle comes from the movie The Shawshank Redemption. I am told that The Shawshank Redemption is on the top ten list of many male movie fans in China! The reason that this movie has such a wide appeal across cultures is because of the existential themes that are dramatized in the movie. These themes are universal and resonate across cultures. That is why I have used this Western movie in numerous workshops in Asia to illustrate the principle of freedom from an existential perspective. It was after one such workshop that a young lady shared her beautiful dream with me. I will share her dream with everyone in my next blog in September. Meanwhile in this blog, I will discuss the context of her dream, which arose out of one of the most beautiful moments in cinematic history (in my opinion), filled with profound symbolism. If you’ve watched the movie, you’ll know which moment I’m talking about when it comes to “listening to the music.” I use this scene to teach students that therapy and life is about creating and being attuned to such ephemeral and transformative moments. Yes, there are predictable stages in the therapeutic process. But what I find matters most in therapy is not the progression across these broad stages but the fundamental shifts in consciousness, perspective, and attitude that occur as the result of these beautiful transformative moments of connection. It is critically important that we become attuned to such melodies and opportunities in life. That we become attuned to moments for creation and those for rebellion, and to seize them to create life-changing beauty. If we are overly focused upon our preconceived plans, we will more than likely miss these important opportunities. All together, these moments are less than one percent of the total time spent in therapy, but it is during this ephemeral yet eternal one percent of the time that transformation occurs. The other 99 percent are not without their importance. We need our treatment plans for they help us to organize our thinking and manage our own anxieties. After all, it took Andy, the main character in the movie, six years of weekly letters to the bureaucrats to get the library built. He had a vision and persevered. The library, along with Andy’s other meaningful life projects, would not have been built without a plan of action and the determination to carry it through. However, Andy was also free and flexible enough to recognize and seize this beautiful moment of creation before it passed him by. Andy did not wake up that day thinking he will liberate the prisoners within Shawshank Prison. He did not even know that he was to receive his library reward that day after six years of faith and persistent labor. It was impossible for Andy to plan for or control such moments. Yet, paradoxically, Andy had been preparing all of his life for such a moment. His knowledge of opera, literature, and the arts was likely the result of life-long cultivation. In addition, the courage for rebellion was born out of the regular abuse he received as a prisoner, including the disrespect he received from his jailers immediately following the triumphant celebration of his arduous accomplishment. Andy was able to maintain his dignity and channel his anger through this meaningful act of creation and rebellion. I have no idea to this day what them two Italian ladies were singin’ about. Truth is, I don’t want to know. Some things are best left unsaid. I like to think they were singin’ about something so beautiful it can’t be expressed in words, and makes your heart ache because of it.